Photo credit WNYC and Casey De Pont. 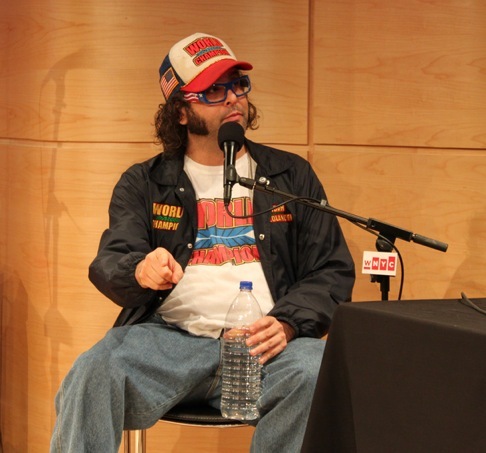 Judah Friedlander is a regular on NBC's 30 Rock and the author of How To Beat Up Anybody. He is the World Champion. Judah joined us on our live show at WNYC to discuss the differences between a Yeti, a Sasquatch and a Bigfoot (and how to beat up all three). He also delineated his strategies for fighting groups of people and even groups of strippers. When Friedlander's not beating people up, he plays writer Frank Rossitano on 30 Rock. He's had a long and successful career on stage as a standup comic, and his film roles include an acclaimed turn as the Original Nerd, Toby in "American Splendor."